Welcome! I am running for 2019 IEEE President-Elect. In this web site, I would like to offer you some information about my activities and share with you my vision on strategic directions for future actions of our IEEE. I greatly appreciate and value your feedback, comments, questions, and suggestions. 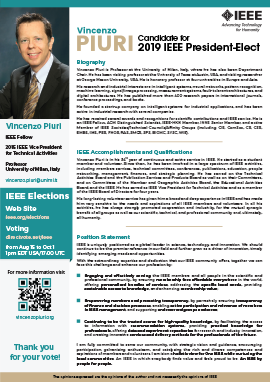 I look forward to your support and respectfully urge you to vote in the IEEE elections. IEEE is uniquely positioned as a global leader in science, technology, and innovation. We should continue to be the premier reference in our field and further grow as a driver of innovation, timely identifying emerging needs and opportunities. Continuing to be the trusted source for high-quality knowledge, by facilitating the access to information with recommendation systems, providing practical knowledge for professionals, offering data and experiment repositories for research and industry innovation, and creating innovative services and delivery methods for the professionals of the future. I am fully committed to serve our community, with strategic vision and guidance, encouraging participation, galvanizing enthusiasm, and catalyzing the rich and diverse competences and aspirations of members and volunteers. I envision a holistic view for One IEEE while nurturing the local communities. An IEEE in which everybody finds value and feels proud to be. An IEEE by people for people.